The Fanatic Carbon Pro 100 Adjustable paddle is the best option offered by Fanatic for those looking for a full carbon adjustable paddle. 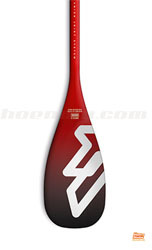 This paddle is the top of the Fanatic range and responds to those who seek excellence in paddling. The Fanatic Carbon Pro 100 Adjustable paddle mounts a super light and resistant carbon 100% 12K blade, combined with a 100% carbon 3K shaft, it is an all-round super-strong and extra lightweight paddle. Fanatic paddles include the Union Joint System, which is the system used by the brand to join the part of the paddle with the shaft, which is higher than normal, preventing this connection from being in one of the critical point of paddling. In addition Fanatic uses the anti-twist system in this adjustable version to ensure that the knob does not move from its position when we exert maximum strength in the paddling. Available in two sizes, 6.75" or 7.25", we recommend the smaller if you prefer to maintain a high cadence, while the larger size is the one we recommend for those who paddle stronger. 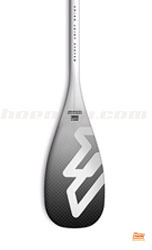 The Carbon Pro 100 is the paddle that Fanatic top riders use.